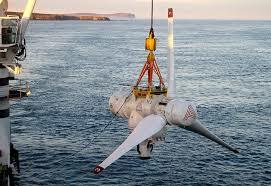 Deploying Atlantis Resource's AR1500 Turbine. All four turbines will have strain gauges fitted to the blades or hub. The strain gauge data will be available through the turbines’ SCADA system at the power conversion centre. Samples can be taken for cross referencing against target identification on Active Acoustic Monitoring (AAM), PAM and video. Further investigation will be required based on operational data to understand the capability of strain gauges to detect collisions. While the turbines are deployed. Pentland Firth MeyGen AR1500 and HS1500 Strain Gauge Data is located in United Kingdom.